Malout : Farmers owing allegiance to various organisations held a protest and showed black flags as Prime Minister Narendra Modi arrived here on Wednesday to address a rally.The Punjab Police and security agencies stopped the protesting farmers at a distance from the venue and some were detained.Tight security arrangements were made as Modi arrived in Malout town, around 275 km from Chandigarh, to address a “thanksgiving rally” organised by the Shiromani Akali Dal (SAD) to mark the “biggest hike in MSP of paddy”, which was announced by the Modi government last week. SAD President Sukhbir Singh Badal had termed the Minimum Support Price (MSP) hike as an “unprecedented historic increase”. 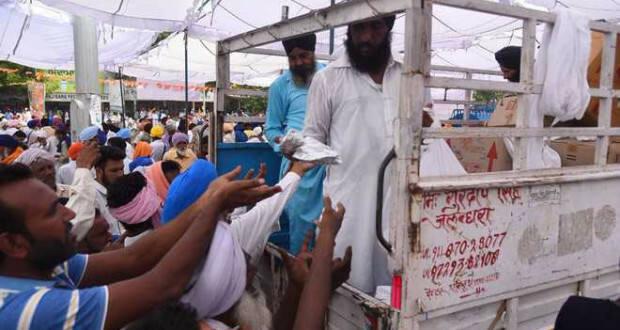 Farmers from Punjab, Haryana and Rajasthan participated in the rally as Malout town in south-west Punjab’s Muktsar district lies close to the border of all three states. The Prime Minister had last week hailed the Union Cabinet’s decision to give MSP of 1.5 times on the input cost to farmers as “historic”.He also asserted that his government will continue to take steps for the welfare of the farming community, including doubling the income of farmers by 2022. Punjab Chief Minister Amarinder Singh has dismissed the MSP hike announced by the Centre as “nothing more than a cosmetic measure”, adding that it does not address the core concerns of the farming community.